Located just ten miles from the nation’s capital on the shore of the Potomac River, the Alice Ferguson Foundation (AFF) was established in 1954 as a nonprofit organization, chartered in the state of Maryland. The three core programs consist of the Hard Bargain Farm Environmental Center for elementary students, the off-site Bridging the Watershed program for secondary school students in national parks, and the Trash Free Potomac Watershed Initiative along with other community outreach programs. Our mission is to provide experiences that encourage connections between people, the natural environment, farming, and the cultural heritage of the Potomac River Watershed, which lead to personal environmental responsibility. 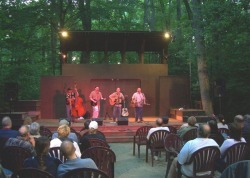 The Amphitheater at Hard Bargain Farm is home to the annual performance series Concert in the Woods and Theater in the Woods and holds productions from spring into fall.